Industrial rotating machinery relies upon rolling bearings to reduce friction, power consumption, and heat generation, while simultaneously supporting increasingly heavier applied loads at higher speeds with a higher degree of accuracy. 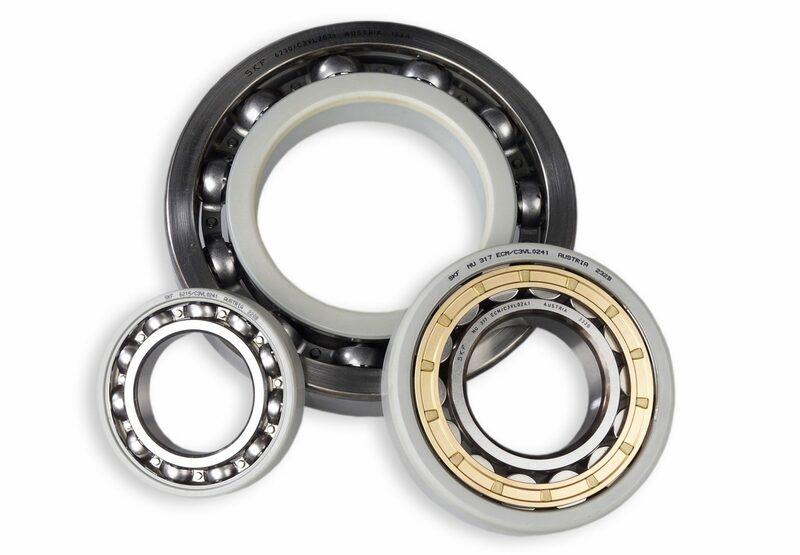 With the need for bearings in all their many designs and types to perform reliably at every turn, it’s no wonder that questions frequently will arise relating to the technology. The resulting insights ultimately can help guide operations in realizing optimized outcomes for any bearings application. Rolling bearing lubrication serves to prevent wear and resulting damage between a bearing’s rolling and sliding contact surfaces, and also needs to reduce friction and heat generation, help protect against corrosion, and help keep out contaminants. Any discussion of lubrication naturally turns to the choice between grease and oil. When feasible, grease is typically the preferred bearing lubrication choice, because it is easy to apply, can be retained within a bearing’s housing, and helps improve sealing against solid or moisture contamination. Lubricating greases consist of a mineral or synthetic base oil that is suspended in a thickener or soap. Additives may also be introduced to impart characteristics such as protection against wear or corrosion and friction-reducing properties. 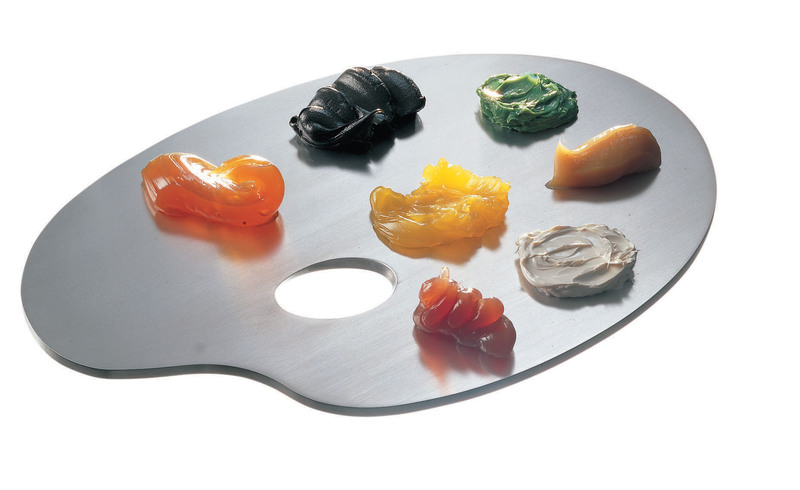 By varying base oil viscosities, thickeners, and additives, greases can be developed with distinct characteristics to satisfy particular applications and operating conditions. Oil lubrication will usually be specified when high speeds, high temperatures, or lubricant life and cleanliness preclude the use of grease. When application conditions permit, the advantages of oil include easy filling and draining, increased bearing speed capability, reduced heat generation, and the capability to filter contaminants. Mineral oils represent the most common oil lubricant choice for rolling bearings due to their good performance for a wide range of applications. Synthetic oils will usually be selected in extreme cases, such as very low or very high operating temperatures, or when the oil service life needs to be extended. Rust and oxidation inhibitors are typical additives for extending the life of lubricating oils, and extreme pressure (EP) and anti-wear (AW) additives are used in special cases to reduce bearing wear and to extend bearing life. Making the critical lubrication decisions will contribute to success or failure of equipment in service – but decision-making can become complicated since no single “universal” lubricant exists to cover all application scenarios. A knowledgeable lubrication specialist ideally can help in identifying and implementing best lubrication practices tailored to an application. Bearings can easily be damaged or installed incorrectly when the wrong tools or improper mounting techniques are used. This can lead to poor bearing performance and a shortened bearing life inside the machine. The numbers tell the story: An estimated 16% of all premature bearing failures can be directly attributed to an incorrect bearing installation (damage from excessive force, improper adjustment setting, or damage from improper tools). The most effective and popular mounting techniques can be divided into three main categories: Mechanical mounting, Hot mounting, and Hydraulic mounting. Mechanical mounting (also known as Cold mounting) is generally recommended for small- and medium-sized bearings with an outside diameter up to 4.0 in. (100 mm). Hot mounting and Hydraulic mounting methods can be used for all bearing sizes, but are mainly used for medium to large sized bearings. Tools have been developed to accommodate each method and bearing size range. Mechanical mounting uses a mounting force sufficient enough to overcome the interference fit between the bearing and the shaft and housing components. The most popular version of Mechanical mounting involves impact forces created by a dead-blow hammer that are transferred to the bearing rings through a customized abutment sleeve. Other techniques include a compressive mounting force generated by an arbor press or a threaded clamping device. In Mechanical/Cold mounting, the misguided practice of using a standard hammer and pipe for the job has long been discredited due to the damage that can occur. This practice can cause metal debris to enter the bearing or, if not done properly, a slip of the pipe or hammer can impact the internals of the bearing and cause damage. Best practice: The use of customized fitting tools to eliminate harmful brute force and apply the proper force to both bearing rings to isolate the rolling elements from the impact force for a more reliable installation. Hot mounting involves heating the bearing prior to installation to a specific temperature (175ºF to 250°F, depending on the bearing design) so the bearing bore will expand radially. This temporary expansion of the bearing bore allows for easy installation onto the shaft to overcome the shaft interference fit. Once the bearing cools and returns to room temperature, the intended shaft interference fit with the bearing bore is achieved and the bearing returns to its original dimensions and tolerances. How the heat is applied to the bearing, however, can make all the difference. For example, open flames and torches are never recommended for heating bearings, and conventional hot oil baths should be avoided as well, due to the increased probability of bearing contamination, hot oil splashing, and safety risks for the operator. Best practice: Induction heating is the most reliable technique to heat bearings prior to installation, because induction heating allows for a high degree of temperature control, quick set-up and heating speed, and operator safety. The temperature setting control, magnetic bearing temperature sensor, and digital display on induction heaters help prevent bearing damage during the heating process. These solutions stand in direct contrast to less effective (and potentially dangerous) methods, including an open flame, hot oil baths, and ovens, or hot plates. For the larger bearings or applications with precision mounting requirements, Hydraulic techniques, including hydraulic pumps, oil injectors, and hydraulic nuts, deliver the goods. Hydraulic techniques allow for more control and further help to maintain precision, accuracy, speed of installation, and repeatability; minimize the risk of damage to bearings and shafts; require less manual effort; and promote operator safety. When an electric motor, turbine, or other driver is coupled to a pump, generator, gearbox, or other equipment, the shafts and coupling of the two must be properly aligned. Otherwise, parallel or angular misalignment between the two machines will cause increased stress on the shafts, seals, and rolling bearings, which will jeopardize the machinery health and operation. Bearing misalignment can be caused by shaft deflections (bending) under applied loading, tolerance errors associated with the shaft and housing, uneven bearing support surfaces, and misalignment between coupled shafts or components. Excessive misalignment will result in increased internal loading, friction, heat generation, and decreased bearing life. Conventional rigid bearings have strict limitations for misalignment: approximately 2 to 10 minutes of arc for deep groove ball bearings and angular contact ball bearings, and approximately 2 to 4 minutes of arc for cylindrical roller bearings and tapered roller bearings. This limited capability has led to the development of self-aligning bearings engineered to accommodate much higher misalignments. The self-aligning bearing has a raceway curvature based on a sphere, which will self-adjust to the misaligned conditions of the shaft and housing. The self-aligning capability can also accommodate initial misalignment due to machining or mounting errors. 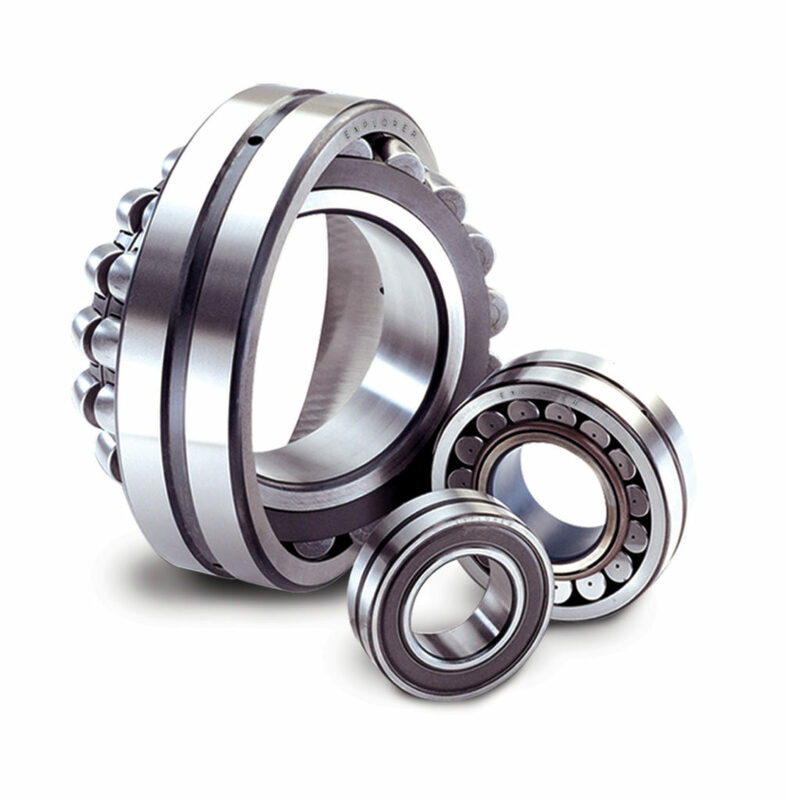 Types include self-aligning ball bearings, spherical roller bearings, toroidal roller bearings, spherical roller thrust bearings, angular contact spherical plain bearings, insert bearings, alignment needle roller bearings, and spherical plain bearings. Their precise misalignment capability will depend on the specific bearing size and design. Values for the permissible misalignment will be supplied by the bearing manufacturer, which also can assist when the expected misalignment in an application will exceed the permissible limits. Coatings offer practical methods to “upgrade” bearing materials and/or provide bearings with add-on benefits for specific application conditions – effectively improving performance under difficult operating conditions. Most bearing types can be coated to promote longer bearing life and enhanced machinery uptime. Depending on the formulation, specialized bearing coatings can reduce the damaging effects from vibration, improve performance under poor lubrication, help prevent adhesive wear (smearing damage), improve corrosion resistance, and reduce friction. A patented NoWear® wear-resistance surface coating can be applied (by the manufacturer) to a bearing’s rolling elements or raceway surfaces. The coating (only a few microns thick) covers the contact surfaces using a specialized process ideally suited for bearings. Surfaces coated with this low-friction carbon coating will retain the toughness of the underlying bearing steel while adopting the hardness, improved friction properties, and wear resistance of the coating. Providing insulating properties “from the outside,” an INSOCOAT® coating protects bearings against potential electrical erosion damage caused by the passage of AC or DC electric current through the bearing. The coating’s thin aluminum oxide layer imparts an electrical insulating function into the bearing to form a superior barrier against electric arcing and the potentially damaging erosion of bearing surfaces. The coating is applied to the bearing bore or outside diameter, depending on the bearing size. The coating does not change the bearing’s overall dimensions, so no modifications are required for the machine. Examples of other coatings include zinc chromate, which can serve as an alternative to stainless steel bearings in a corrosive environment, especially in the case of ready-to-mount bearing units. All these insights can help contribute to a better understanding of the fundamentals associated with rolling bearings and in meeting particular application requirements and challenges. Established bearing manufacturers such as SKF can further assist as partners in the process. SKF has been a leading global technology provider since 1907. Their fundamental strength is the ability to continuously develop new technologies – then use them to create products that offer competitive advantages to their customers. Matthew McCormack is an Applications Engineer at SKF USA Inc., based in Lansdale, PA. He can be reached at +1-267-436-6821 or Matthew.E.McCormack@skf.com.